We all use stereotypes in everyday life, whether at the grocery store or filling up at the gas station or at a scientific symposium. For better or worse, they help us categorize the world around us. But they can also get us into trouble when we forget to allow the people around us to be larger and more complex than we expect them to be. Stereotypes are so embedded in our conscious and subconscious that they end up on the pages of our novels before we really have a chance to process why we have chosen them. 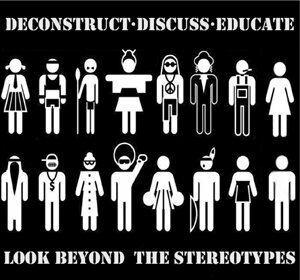 These are a few reasons why you should avoid stereotypes in your characterizations. They are unrealistic. People are wide and varied in their looks, interests, and self-expression. Fiction does not always have to reflect reality, of course, but if anything it should push the boundaries and create more options instead of less. They are limiting. Once you decide to allow a character to conform to a stereotype, there’s not much left for them to do. You’re stuck having them act according to that stereotype instead of allowing yourself room to write the story outside those limits. Stereotypes mean flat characters. There’s nothing to a stereotyped character. No motive, no real depth or dimension to him. And once they stop having depth, your characters become uninteresting. Why would you want your characters to be predictable and boring? If you want your novel to be memorable, you’re going to have to take some time to examine your characters and root out as many stereotypes as you can. Here are four ways to avoid using stereotypes in your writing to create rounder, more realistic characters. Spend some time people watching, and especially people that are different than you. I know this sounds a little stalker-like, but if you take the time to observe (or better yet, get to know) people who are remarkably different from you, you’ll begin to see how varied their actions, interests, body types, and style preferences are. Inform your writing by learning as much as you can about the people you are trying to portray and writing them as realistically as possible. Challenge convention. If you can’t find people similar to the characters you are writing, that’s ok. Take a few minutes to ask yourself why you portray each character the way you do, what purpose they serve in the story, and whether your story would be better served if that character did something completely contrary to what people expect. Why constrict your writing and your characters’ potential by forcing them to conform to a specific trope? Create rounder characters. The definition of a stereotype speaks for itself. It’s oversimplified–a caricature. You owe it to your characters to make them as deep and complex as possible. Again, this comes back to why you portray a character a certain way. Ask yourself if there’s a deeper, more meaningful way to describe that character or their actions. Make your characters unforgettable. How do you do that? By having them do unexpected things. If a character is flat and unimaginative, if he/she/it conforms to the expectations of your readers in style, language, and actions, then he/she/it will probably not leave much of an impression. Readers remember characters that shake up their world and challenge their preconceived notions of reality. Discovering stereotypes and conscientiously eliminating them from your writing is hard! It requires that you do some deep self-reflection as well as some heavy developmental editing. But your writing will benefit so greatly from the exercise. And your readers will deeply appreciate the effort.